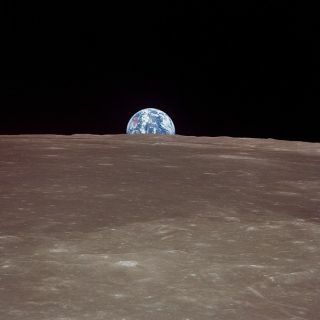 This image taken July 20, 1969 from NASA's Apollo 11 lunar landing mission shows the Earth rising over the limb of the moon. The image was among NASA's first posts on the social photo-sharing service Instagram. Space fans, rejoice! NASA is extending its social media reach by launching a new Instagram account, giving people the chance to share out-of-this-world photos on the go, according to agency officials. "We're constantly looking to expand our social media portfolio to include tools that will best tell NASA's story of exploration and discovery," NASA spokesperson Lauren Worley said in a statement. Instagram, the popular photo- and video-sharing social network service will provide more opportunities for NASA to connect with its fans. "Instagram has a passionate following of users who are hungry for new and exciting photos," Worley said. "We believe we have some of the most engaging images on and off the planet — and we can't wait to engage with instagrammers." The new NASA account will feature space photos and videos to promote aeronautics, astrophysics, Earth science, human spaceflight and more, agency officials said. The space agency's first posts shared glimpses of the launch preparations for the Lunar Atmosphere and Dust Environment Explorer (LADEE) probe, which streaked into space in a dazzling night launch on Friday (Sept. 6) from NASA's Wallops Flight Facility on Wallops Island, Va.
To highlight the lunar mission, NASA officials will post historic moon images and real-time photos from the Wallops Island launch complex before and during LADEE's liftoff. Visit NASA's Instagram account to follow along: http://instagram.com/nasa. The robotic LADEE satellite is designed to orbit the moon, collecting detailed information about the structure and composition of the lunar atmosphere.